"Didn't think driving lessons would be so much fun"
Tommy Bissett, passed first time, May 2007 at Winchmore Hill. There is also a refresher service for individuals who may have passed their driving test but have not been behind the wheel of a car for some time. 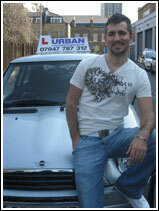 If you feel you are lacking driving practice or have not driven a car since passing your practical driving test some time ago, then why not get in touch with Urban and book yourself some refresher lessons. Our instructors will be extremely helpful and will advise you on the best course of action. The main objective with these lessons is to get you driving safely as well as build your confidence so that driving alone will not be such a daunting prospect.